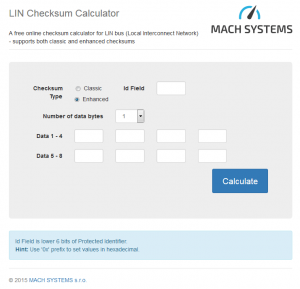 Online LIN Checksum Calculator - MACH SYSTEMS s.r.o. We launched a simple online tool for calculation and verification of LIN bus frame checksums. The tools supports both Classic and Enhanced checksums defined by LIN v1.3 and 2.x.